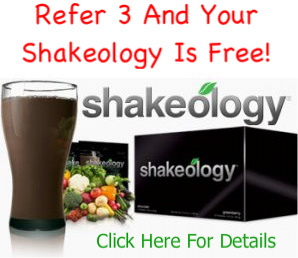 If you are looking for a Shakeology discount, you have come to right place. In this post I’m going to let you know about several different options you have when purchasing Shakeology, and ultimately which option is the best and will save you the most money overall. I want to start off by saying that Shakeology is truly a great product and worth the price. When Shakeology first came out, I was skeptical and my original thoughts were, “great, another stupid shake”. But after hearing great things about Shakeology, and doing research on the ingredients, and the nutritional benefits they had to offer, I decided to try it for myself. Not only is Shakeology extremely healthy for you, but it also tastes great, which I didn’t expect. The biggest objection people have to Shakeology is the price. But at near $4 a serving it is comparable to, and even cheaper than the fancy lattes and cappuccinos that people buy everyday from Starbucks. I think that going to Starbucks, and spending $4 a day, is a lot easier on the mind, then dropping $120/month. Although it is the same thing monetarily, the brain justifies the expenses different. Anyone can afford $4 a day, but when you tell them that it is going to cost $120 a month they freak out. I understand this mentality, but I just wanted to point it out to make it aware that this is what you are most likely doing. To justify the cost of Shakeology, you are replacing something unhealthy, with something that provides nutritional value, and the cost stays the same, or close to the same. For example, you will be replacing your morning coffee and bagel, Red Bull, 5 Hour Energy, Donut, or whatever it is you have every morning with Shakeology. The cost will be close to the same, and you will get the nutrition your body needs. Anyone can take advantage of the free shipping Shakeology discount. 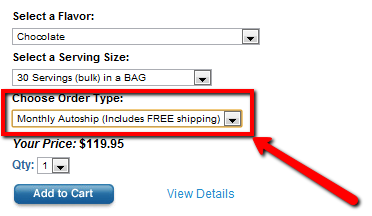 In order to get free shipping, all you need to do when placing your order is choose monthly autoship. Now I know what you might be thinking, “what if I don’t want monthly autoship?” If you don’t want monthly autoship, you can still select that as your choice to get the free shipping Shakeology discount, which will save you approximately $10 on shipping. Then, all you need to do is remember to call customer service at 1 (800) 470-7870, and let them know that you want to cancel your autoship order. Just be sure to call within 30 days before you are automatically re-billed. There is no penalty for canceling your autoship, and this is an easy way to get a small Shakeology discount by getting free shipping. And chances are, you’ll love Shakeology anyhow, and will want to be on autoship, this way you never forget to re-order and never have to worry about running out. The cost to become a Club member is $2.99/week, and is billed quarterly at $38.87. Because of the cost of the Club membership, the 10% discount you’d receive on Shakeology ends up being a wash, so you’d really be breaking even. So you can get all the benefit of the club membership, and the discount, for pretty much the same price. And if you are planning on buying other supplements like the protein bars, recovery drink, or any new workout programs, you will get a 10% discount on all of those too, which can add up and is really how you would ultimately save. Click Here To Become A Club Member! The 2 sites listed above are what the $15/month fee pays for. The initial fees to become a Coach will be a little more expensive than just buying Shakeology, but over the course of a few months you will break even, then eventually be saving money with the 25% Shakeology discount. If you plan on drinking Shakeology on a monthly basis, becoming a Coach is a good idea. 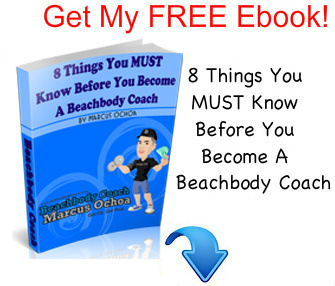 So depending on what you want to do, becoming a Coach might be your best option. And remember you can also earn money by referring others, so if you were to refer 3 other Shakeology customers, the commissions you would make from the sales would be enough to pay for your own Shakeology. If you are going to purchase Shakeology, you may want to consider purchasing a Challenge Pack because it is the overall best deal. With a Challenge Pack you would get Shakeology, the workout program of your choice, and a 30 day free trial to a club membership. Depending on which Challenge Pack you choose, you can save over $55 by purchasing a Challenge Pack. For example, a P90x Challenge Pack costs $205, below I show how the price breaks down. Also, it is important to know that you can save even more money if you decide to become a Beachbody Coach. If you purchase a Challenge Pack during the Coach signup process, the $39.95 Coach start up fee is waived! No Thanks, I Just Want To Buy Shakeology!